LCDR John Glynn of Glynstewart, USN (Ret.) 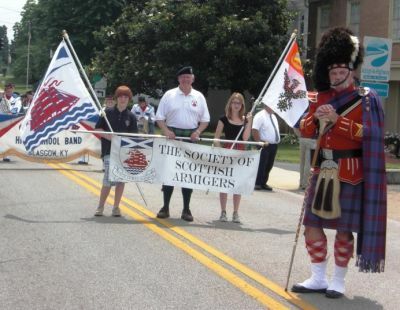 and two of his grandchildren, Tristan James Miles carrying the Society of Scottish Armigers Banner and Alexandra Kathryn Miles carrying Glynstewart's personal banner during the Glasgow Highland Games parade held in Glasgow, Kentucky. Also to the right in the photo is the Glasgow Highland Games Drum Major Greg Cutcliff a close personal friend of Glynstewart and his family.